We’d love your help. 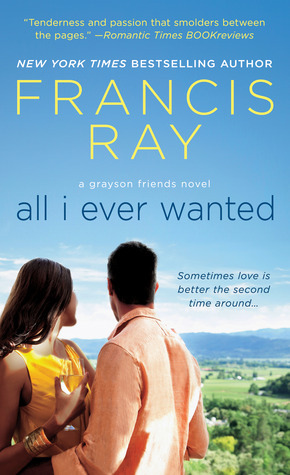 Let us know what’s wrong with this preview of All I Ever Wanted by Francis Ray. Naomi Reese is a divorced mother with a small daughter named Kayla, a new life in Sante Fe, and, finally, some distance from her abusive ex-husband. All she wants now is a home of her own where she and Kayla can finally feel safe. With one bad marriage behind her, she can't even dream of falling in love again. A tall, handsome veterinarian with a w Naomi Reese is a divorced mother with a small daughter named Kayla, a new life in Sante Fe, and, finally, some distance from her abusive ex-husband. All she wants now is a home of her own where she and Kayla can finally feel safe. With one bad marriage behind her, she can't even dream of falling in love again. To ask other readers questions about All I Ever Wanted, please sign up. Love the Graysons and their friends. If only life imitated art? OMG this was one of the best books I've read. I love the Grayson Series and the friends. I loved the courage of Naomi to overcome her fears and Richard was the best person in the world to help her. His patience was outstanding. I can't wait for Lance and Fallon's book. Great work Ms. Ray. Francis Ray brings in home again. I have yet to read one of her books and not fall in love with it. She finds was to bring tears to my eyes and joy to my heart. Her books instill hope. Thnk you for another phenomenal book Mrs. Ray!!! Naomi had to learn to not let fear consumer her life. Richard was there to teach her that there was nothing to fear in him. Their journey long the pay off immeasurable. Take a look at the journey to love. I just love this book. I'm so happy Naomi faced her fears and let Richard love her. Can't wait for Fallon and Lance story. Mrs. Ray has done it again. Amazing story! I waited for this for a while! It was great to have a more in depth look at Naomi and Richards relationship. I waited for Naomi to have a happy ending! This was a story that can depict real life and although the main character, Naomi, was in an abusive relationship in her past, she didn't come off depressing and gave life to her character. After escaping with her daughter, Kayla, Naomi started a new life while constantly looking over her shoulder. After settling down, she has built a new life for herself with a circle of Grayson family and friends. Within this circle she meets, Richard, who has become her saving grace and almost a father figure to her daughter. The opening of the story as dark as it seems describing Noami's past, it draws the reader into the story as you are interested in following Naomi's life. Because of Naomi's past, I thought the pace of Richard and Naomi's Romance was appropriate and appealing. There romance started out slow, but warming up to both characters was apart of the appeal to me. Of course, it is always a pleasure to see familiar names/characters from previous books connected to the Grayson family and friends. Kayla was a sweet heart and an important character in this story, without her, I don't think the appeal of Richard and Naomi in this particular story would be what it is. I also liked the chemistry between Fallon and Lance. Fallon was Naomi's neighbor and Lance was Richard's cousin. Apart from liking this story a lot, it had a sort of simplicity to it. I actually wanted more details on Naomi's family, as she wasn't able to depend on them throughout the story so that peaked my interest. I also that the ending came to an abrupt end. Apart from these things, for me, this was a likable and enjoyable read from the author and a well added addition to the series. Love, love, love it. Naomi left an abusive marriage to start over. Dr. Richard wanted more out their friendship. But Naomi had to get over her fears and trust issues. The Grayson's are such a close knit family. You will definitely enjoy this read. Readers have been waiting a long time for Naomi and Richard’s relationship to come to life and Ms. Ray did not disappoint. All I Ever Wanted provided more insight into Naomi’s past relationship and how it was continuing to affect her and her daughter. Richard, Catherine and Luke were godsends for Naomi and aided in overcoming her past and rewriting her future. Richard was a very patient man and little Kayla was such a sweetheart in this book. Naomi tried to consistently push Richard away but he Readers have been waiting a long time for Naomi and Richard’s relationship to come to life and Ms. Ray did not disappoint. All I Ever Wanted provided more insight into Naomi’s past relationship and how it was continuing to affect her and her daughter. Richard, Catherine and Luke were godsends for Naomi and aided in overcoming her past and rewriting her future. Richard was a very patient man and little Kayla was such a sweetheart in this book. Naomi tried to consistently push Richard away but he was determined to pursue a relationship with Ms. Reese. This was a story of healing and learning to trust after a disastrous past relationship. The road was not an easy one and did Richard give up on Naomi….readers will have to pick up All I Ever Wanted to discover if these two were successful in finding love. “All I Ever Wanted” by Francis Ray touches on a very real issue…spousal abuse. Naomi is a woman on a mission. Deciding to flee with her daughter in order to escape the abuse, Naomi is happy to have a fresh start. Love is the last thing on her mind but when Richard Youngblood catches her eye; can he make her realize its ok to love again? “All I Ever Wanted” was a good read. I loved the characters. They were very well developed. There were some parts that were a bit predictable but overall the st “All I Ever Wanted” by Francis Ray touches on a very real issue…spousal abuse. Naomi is a woman on a mission. Deciding to flee with her daughter in order to escape the abuse, Naomi is happy to have a fresh start. Love is the last thing on her mind but when Richard Youngblood catches her eye; can he make her realize its ok to love again? “All I Ever Wanted” was a good read. I loved the characters. They were very well developed. There were some parts that were a bit predictable but overall the story flowed well. I look forward to reading more from this author. This was not well paced. Part of my problem was as I said that I thought Naomi and Richard had been together in the background of the series for quite some time. Apparently not. The next problem I had was with the pacing, Naomi spends half the book pushing Richard out of her life and the turns around and is leaning towards marriage and so the relationship is especially rushed as it has half the time to show us why Naomi is willing to trust Richard. And finally I'm sick to death of the abusive ex s This was not well paced. Part of my problem was as I said that I thought Naomi and Richard had been together in the background of the series for quite some time. Apparently not. And finally I'm sick to death of the abusive ex story right now. No-one's doing anything new with it and it's starting to be overdone. Enjoyed it very much. Good characters and interesting subject. For the longest I did not like Naomi because although she went through a lot, she was just untouchable to me. Richard did everything he could and she still wouldn't trust him. And I really would've thought that Luke and Cath would have adopted a baby or had IVF by now. Slow & steady read. I wanted her to quit playing the victim but the romance works. An EXTREMELY sweet read. A bit slow getting to the romance and/or action...but still a good read...nice to see how Naomi and Richard FINALLY got together. This was one of those books I was waiting years for Francis Ray to write (like Rio's story coming out later this year can't wait!!!) She did not disappoint! Loved it! This book was a good read...i felt,like it was a bit rush....i got tired of Naomi pushing Richard away....But they found love in the end...it was very predictable.